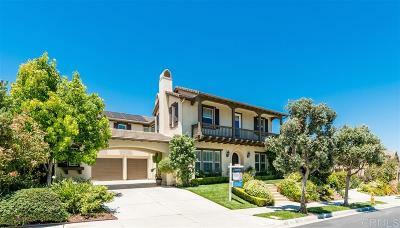 Fabulous & immaculately maintained home in prestigious La Costa Ridge. The great attention to detail is seen in every exquisite finish thru-out. Features include: beautiful hardwood flooring, crown moulding, custom designer paint, gourmet kitchen w/SS appliances & granite counters, formal dining room w/coffered ceiling, courtyard w/fireplace, bonus room w/balcony, downstairs bed & bath, master retreat w/fireplace & huge walk-in closet, dream backyard w/sparkling pool & spa, built-in surround sound + more!, Picturesque exterior & lush landscape invite you inside this grand home. Once you enter, take in the sight of the gorgeous hardwood floors that flow perfectly throughout the downstairs. The formal living room is just off the entry & large enough to gather all your friends & family. Continue down the hall to the guest bedroom & full bath, perfect to use for company. Make your way to the formal dining room with beautiful coffered ceiling & access to the courtyard where you can open up the french doors to enhance outside/inside dining. The open style family room & kitchen makes for a great place to entertain while never missing a beat. Fit for any chef, the gourmet kitchen features top of the line stainless steel appliances, including a 6 burner gas stove, double ovens, wine cooler & warming drawer, huge center island w/eat-in bar & an additional dining area. Head upstairs to find the expansive master retreat w/fireplace & sitting area, as well as a spa-like en-suite w/dual vanities, large soaking tub, separate shower & huge walk-in closet w/built-in shelving & drawers. There are 3 more guest beds (1 with it's own en-suite bath), a loft/bonus room w/balcony & large full bath w/double sinks. 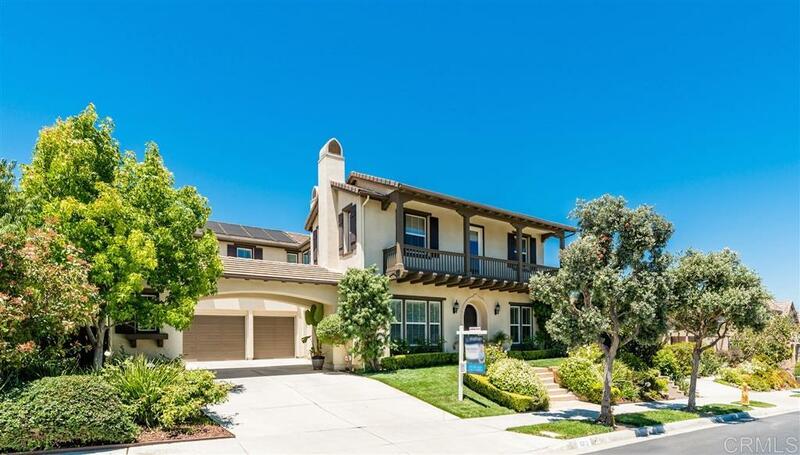 Enjoy the wonderful weather Carlsbad has to offer in your private oasis w/sparkling pool (solar heated) & waterfall, spa, built-in BBQ w/mini refrigerator, outdoor fireplace & side yard.